The National Center for Educational Achievement (NCEA) recently named four Imagine Schools campuses Higher Performing Schools. According to the NCEA, this designation affirms that Imagine Schools successfully advances students “toward college and career readiness in one or more content areas tested by AIMS.” Through rigorous curriculum and personal development strategies, Imagine Schools prepares students to lead lives of leadership, accomplishment, and exemplary character, an achievement that is recognized by this award. The State of Florida recently recognized Imagine Schools’ commitment to academic excellence by naming seven of its campuses high-performing schools. 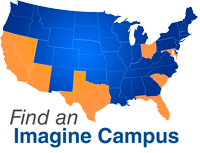 This designation highlights academic rigor and improved outcomes for Imagine’s students. Imagine Schools has been named as a 2013 National District of Character at a recent award ceremony in Washington, DC. The award, given by the Character Education Partnership, recognizes the value of developing exemplary character in students. To strengthen the support and improve performance of its schools within the District of Columbia, Imagine Schools announced today that it has partnered with TenSquare to perform an in-depth review of its two Imagine Hope Community Charter Schools. Once in danger of being closed due to poor academic performance, Imagine Schools at Camelback has earned an “A” rating from the Arizona Department of Education. The inner-city Phoenix school features a free and reduced lunch population of nearly 100 percent. More than 25 percent of the students are English language learners in 12 different languages. Today, Imagine School at Town Center received notification from the Florida Intentional Character Partnership (FICP) that the school is officially a 2013 Florida School of Character.